Mother’s Day is going to be here before you know it! Nothing shows Mother’s how much they are loved and appreciated like a homemade gift. But how do you know where to begin? What if you are on a limited budget? No worries! If you have a few minutes and just a few basic supplies, you can whip up a fun, fancy, and frugal gift in a jiffy with this Mother’s Day craft for kids. These Mother’s Day Tea Cup Pin Cushions are perfect for the mother who likes to sew, loves tea, or just loves a beautiful homemade gift. They are easy to make, and so practical! If you’d like to make one, here’s what you’ll need. You can make it along with Mother’s day craft for kid: a button bouquet. and this mother’s day gift pendant. 1. Thread your needle, no knot, and sew a big running stitch all around the wrong side perimeter of the circle of fabric. Leave a long tail so you don’t pull your thread through. 2. Gather your circle of fabric into a little pouch, leaving a small hole to stuff through, and tie off the ends securely. 3. Stuff until it’s nice and smooth. 4. Using small pieces of stuffing will make this look nicer. Squash it around to make it look even. 5. Apply hot glue in the bottom and sides of your cup. Squash your pincushion down firmly into the glue. Use caution as glue will be hot! 6. Put some coordinating pins in it and you are done! As you can see, since hot glue and pins are used, you will want to supervise this craft for kids very closely. You can add more embellishments such as buttons or rick rack if you wish. Dress this piece up as much as you wish or leave plain. 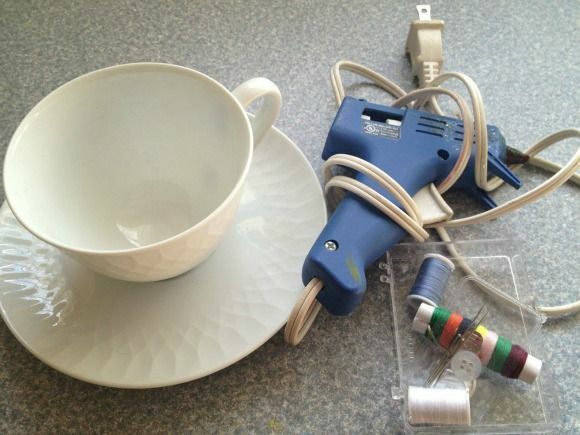 When the glue has had time to set, your cup and saucer is complete and ready for gift giving. I do not even think you need to wrap these as they are attractive enough just as they are! 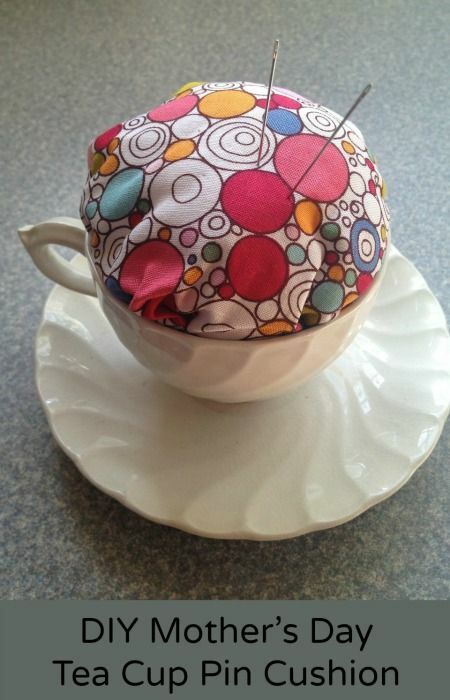 You can pair your tea cup pin cushion with other sewing notions for gift giving or just give as it is. It is so fun and whimsical, and can be left out as a decorative display piece when not in use. The recipient is sure to find it charming and practical, and you will be sure to find it easy to whip up! Give a charming, homemade gift from the heart and hands this year! Mom is sure to love it, and so will your budget! Very cute Katie. I love the fabric choice and the photo quality. This is a great gift idea. What a neat gift for a someone who sews! My Mother does not but i do, I would LOVE this! omgosh this is adorable, what a great idea! This is so cute! Perfect for a Mom, Aunt or Grandma that sews. Kathleen Kennedy-Leon recently posted..geraldine kennedy commented on the post, Happy Earth Day Everyone! Saw this on pinterest the other day! Seriously super cute! I love it! This is just the cutest idea. Pinning this now! What a super cute idea! I actually was thinking I needed a pin cushion recently. These are cute I may just make one for my mom! Awesome!! Just pinned and will be sharing on FB!! Hugs from Freedom Fridays With All My Bloggy Friends! !